Yusef Rabaya, age 19, spent most of his life in bed at home in Jenin. Born with cerebral palsy (CP), he could sit only if he was propped up. Standing was excruciating and dangerous–and could cause permanent paralysis. With CP, a movement disorder caused by brain damage, sometimes the irregular muscle movement pulls on the spine, causing a curve. In Yusef’s case, neuromuscular kyphosis–a curve from the front to the back that presents like a hump, caused him to be bedridden. With time, this curve gets larger. 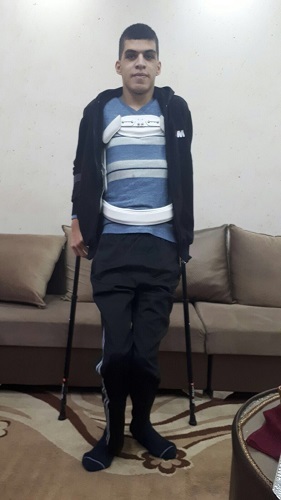 By Yosef’s teen years, his back curved so much that that he couldn’t stand and suffered from terrible pain. Two years ago, they flew to Boston. “We received financial and emotional support from many people in the world–Norwegians, Swedes, and others,” Mr. Rabaya noted. In Boston, rods were implanted in Yusef’s back to strengthen his spine. Tragically, Yusef’s condition worsened and the implanted rods broke in half. The pain was unbearable. Now Yusef couldn’t sit or stand. The solution turned out to be right in Israel. As a result, Hadassah had the equipment brought in from the US. “We received four boxes with rods and screws developed by Dr. Oheneba Boachie-Adjei–an emeritus surgeon at The Hospital for Special Surgery in New York City. Yusef is up walking, with Hadassah’s recommendation for physical therapy to build the muscles that deteriorated during all the time he couldn’t get out of bed. “With my whole heart, I want to thank the doctors and the entire medical team that saved my son,” says Mr. Rabaya. Please watch the video as Yusef takes his first steps.